Качественный компрессор с манометром. Работает от прикуривателя 12в, 10Amp, 85W, 48см шланг, 3 м кабель, 18-20л/мин. Наполняет автомобильную шину примерно за 5 минут. 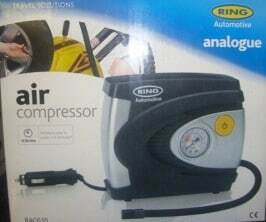 12v Air Compressor with 3 piece адаптер kit for also inflating sport balls and small inflatables. Fitted with fused 12v power plug and approx. 3m cable that stretches the full length of a стандарт car, allowing front tyres to be easily reached and checked. Inflates a tyre to 35psi in under 4.5 min, saving you time. Pressure gauge in PSI, kg/cm2 bar for reliable and accurate performance. 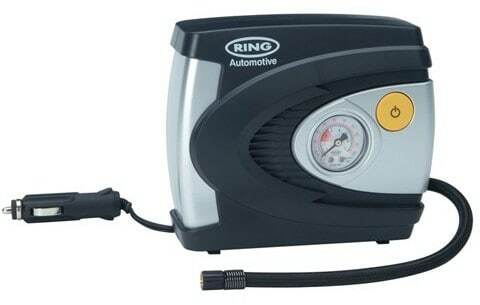 Please Note: The product видео below shows how to use a Ring Air Compressor to inflate a car tyre. The Air Compressor used in the видео is a RAC635.